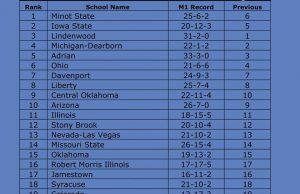 The University of Central Oklahoma hockey team split with the #12 Nationally ranked Iowa State Cyclones over the first weekend back in action after the Christmas break. Friday night the Bronchos jumped out to a first period lead when Nial Mills scored off a pass from Donny Danroth. 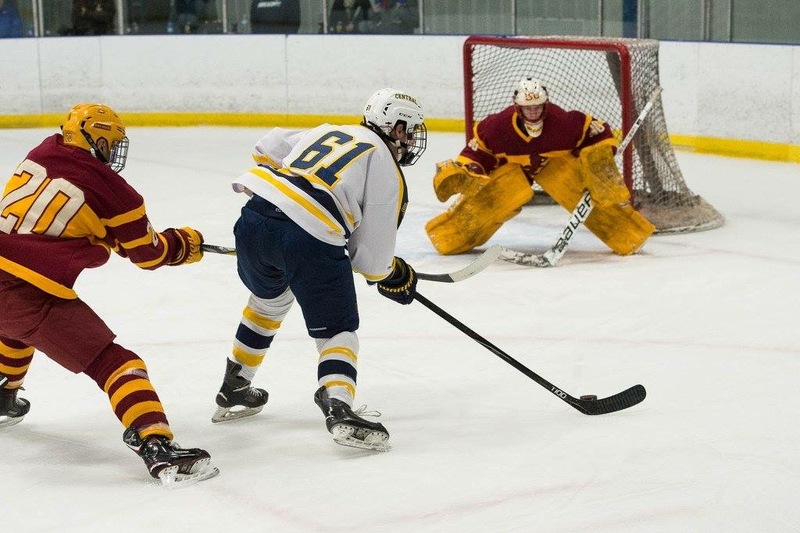 The Cyclones answered with a Powerplay goal from Trevor Sabo but UCO’s Donny Danroth slipped past the Iowa State defense and scored with a nifty move on the Cyclone goaltender with 13 seconds left in the first period to put UCO up 2-1 going into the first intermission. 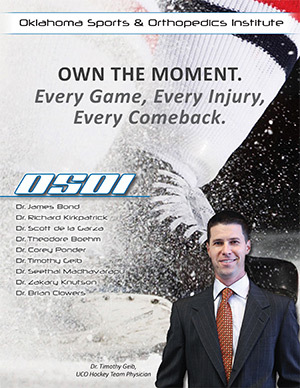 The second period was a back and forth tightly contested period until just three minutes remaining when Iowa State scored off a deflected shot and followed up just two minutes later when Trevor Sabo backhanded a shot that hit the crossbar and bounced into the net behind UCO’s Alex Henry. The Bronchos pushed back again and scored with only 9 seconds remaining with a point shot from Alex Durbeniuk. Iowa State broke the tie in the third period with only 7 minutes remaining but 30 seconds later UCO’s Brandon Formosa scored a Powerplay goal to tie it all up again. Neither team could break the deadlock until Iowa State’s Trevor Sabo scored an OT goal with only 1:30 left and complete his hat trick. 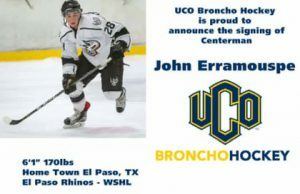 Saturday night the Bronchos were determined not to allow Iowa State to repeat their success as Brandon Formosa scored twice in the first period, and Nial Mills and Gage Joel scoredin the second period to put UCO up 4-0 at the second intermission. Iowa State managed to get on the board in the third period but from the start of the game, UCO dominated the game and UCO’s netminder, Jacob Wallstedt was equally up to the task when called upon. 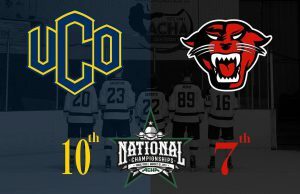 UCO is back in action at Arctic Edge this weekend against Mercyhurst University on Friday night at 7:45pm and Saturday night at 7:30pm.